Dr Stavroula Leka has been awarded a Chair in Work, Health & Policy in the Department of Psychiatry & Applied Psychology at the University of Nottingham. Dr Leka is Director of the Nottingham University’s Centre for Organizational Health & Development which is a World Health Organization (WHO) Collaborating Centre in Occupational Health. Dr Leka studied Psychology at the American College of Greece, followed by postgraduate studies (MSc and PhD) in Occupational Health Psychology at the University of Nottingham. She is Chartered Psychologist. She is an Associate Fellow of the British Psychological Society, a Fellow of the Royal Society for Public Health and a member of the International Commission on Occupational Health (ICOH). 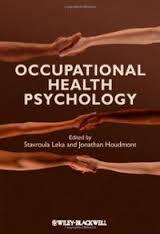 Dr Leka is also a member of the Executive Committee of the European Academy of Occupational Health Psychology (EAOHP) and Chair of ICOH’s Scientific Committee on ‘Work Organization & Psychosocial Factors’. Her research interests lie in the translation of occupational health and safety policy and knowledge into practice, in psychosocial risk management and in the promotion of mental health in the workplace. She has published widely in these areas. She has been a sometime Expert Advisor to the European Commission, the WHO, the ILO, the European Agency for Safety & Health at Work and the European Parliament. Dr Leka was awarded an early career achievement award by the American Psychological Association for an outstanding contribution to occupational health psychology and to the study of work-related stress. This entry was posted in Uncategorized and tagged American Psychological Association, Centre for Organizational Health & Development, European Academy of Occupational Health Psychology, International Commission on Occupational Health, Professor of Work Health and Policy, Psychosocial risk management, Stavroula Leka, University of Nottingham. Bookmark the permalink.